I want to express my gratitude to the collector the purchased this work and to Dominique Boisjoli, my dealer and wonderful supporter in Santa Fe, NM. My first desire when beginning this oil was to create a forest scene that didn't have a high finish. That is, the brushstrokes and even the physical surface of the oil would be rough. Forests are not even, polished places and I wanted this large oil to convey a bit of that experience. In the first session when I applied all the variations of reds and oranges, it wasn't satisfactory to me. The plan was to put in a lot of complexity right away, creating variables in color but sticking to the idea of a single sweep of red trees and make it believable. I did that, and I was underwhelmed. Peeking above the trees was an outline of far blue hills and it was lacking as well. I was too predictable. Everyday is not a happy one in the studio, but I did step up and block in a 4 x 6 foot oil, a worthy accomplishment, so I left it at that. Looking back, what did I expect? That I would have created a really nice oil in one session? In the second session I came back fresh and simply thought about what the painting needed: Contrast. Once the dark tree trunks went in, the painting came to life. The background colors began to sing and suddenly the painting was calling out for improvements in a number of places. I drastically cut back the amount of the blue hill that was visible and in turn, it gave the trees more prominence. Over the next few sessions, it was a pleasure to attend to those needs and take the oil to new places. A number of 'mistakes' were made - attempts that hit a dead end, but those moves opened up new opportunities for other, better solutions. It all came down to making a good start and continuing forward in a way that would not diminish the power and spontaneity that existed at the beginning. I was committed to this single line of trees without gaps or interruptions. This idea created a series of difficult problems across a 6 foot surface, so a lot of small strategies came into play. 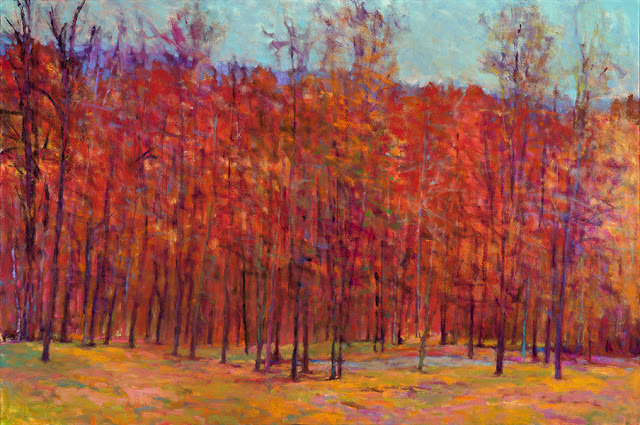 A considerable number of changes were made along the way but always with the idea of creating a large and compelling forest presence that is interesting across the entire canvas.